Within only 5 minutes drive away from Chester and near the border of Wales, The Grosvenor Pulford Hotel & Spais situated with its own landscaped gardens. Now privately owned by the Nelson family since 1994, the previous owners dated back to 1897. The Nelson family have developed and transformed the hotel to what it is today – A 4 star Hotel & Spa and a stunning wedding venue. 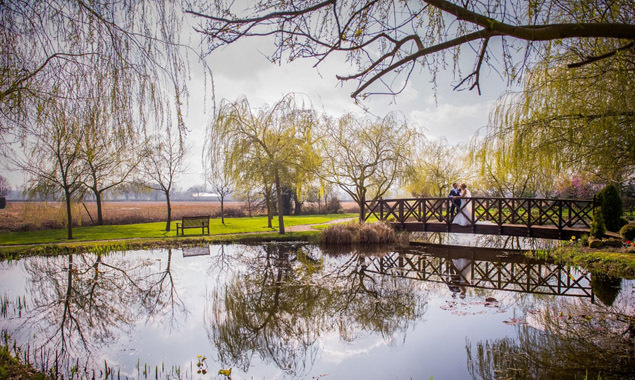 The Grosvenor Pulford Hotel & Spa offers many of it’s amazing settings and locations for your wedding day photographs from their Chinese gardens by the Luxury Spa to the wooden bridge over their own lake. The perfect Cheshire countryside backdrop, you can also opt for photos to be taken in a thatched gazebo or even the wonderful Asian Sensory Garden – which is one of my favourites. The choices are endless. On a summers day you get to enjoy the scenery with drinks served by the lake after your ceremony. Their rather large room which becomes yours for the day, after the ceremony, it later becomes your wedding breakfast and evening reception room. With a separate pound for guests to be seated away from the noise at night, ideal for older guests, they’ve really thought about catering for all your wedding guests. I’ve photographed here many times over the years, so enjoy one of my latest weddings below. If your looking for a photographer to cover your wedding at the Grosvenor Pulford Hotel & Spa, please get in touch. Cheshire has some of the most beautiful wedding venues and locations in the North West. Here we have included lots of real wedding galleries of some of the most beautiful wedding venues.